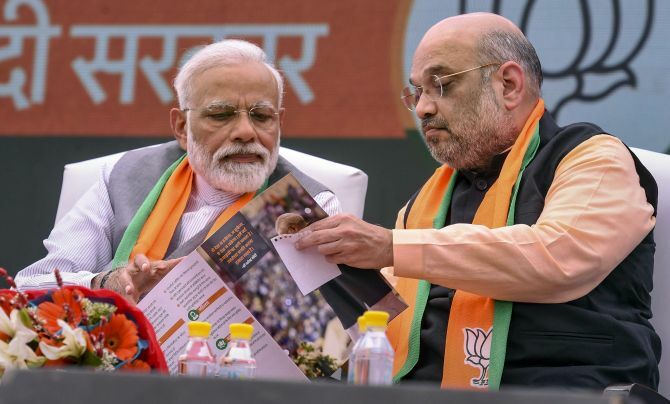 Rediff.com does a quick checklist on what the two manifestos have to say on hot-button issues of the day. -Doubling of farm income by 2022. -Pradhanmantri Kisan Samman Nidhi under which Rs 6,000 a year is given to a farmer owning land up to 2 hectares will be expanded to all farmers in the country. -Pension scheme to small and marginal farmers. -Waiving of all outstanding farm loans in every state. A separate 'Kisan budget'. -Redesigning of Fasal Bima Yojna to make it beneficial for the farmers. -Undoing the changes brought to Land Acquisition Act and Forest Rights Act. -Expediting purchases of outstanding defence related equipment and weapons, strengthening the ‘strike capabilities’ of the armed forces. -Taking more steps towards self-reliance in defence manufacturing. -More effective One Rank One Pension framework for resettlement of veterans, providing them skill training and financial support for higher education, housing and starting an enterprise. -Increase in defence spending and mordenisation of armed forces. -Enhance domestic capacity to manufacture defence and security equipment. -Remove the anomalies’ in One Rank One Pension (OROP). Allowing lateral entry into civil services of retired personnel; full pay and allowances to family of martyrs and a government job to one family member. -More employment generation in sectors like defence and pharmaceuticals. -Collateral-free credit up to Rs 50 lakh for entrepreneurs, guaranteed by the government 50 per cent in case of female and 25 per cent in case of male entrepreneur. -200 more Kendriya Vidyalayas and Navodya Vidyalayas by 2024. -Increasing the number of seats in central law, science, engineering and management institutions by 50 per cent in next fiver years. -A new Ministry of Industry, Services and Employment to look after rapid creation of jobs. Filling all 4 lakh central government vacancies by March 2020. Abolition of application fees for government examinations and posts. -To exempt MSMEs from regulations for three years. -Free and compulsory education in government schools from Class I to XII. Establishing more Kendriya Vidyalayas, Navodya Vidyalayas and more universities. -Abolition of NEET and substituting it with state-level exam. -Trying to build a consensus on simultaneous parliament, state and local body elections. Ensuring a common voter list for all elections. -Police and judicial reforms for better governance. -Introduction of requirement of public consultation before a bill in tabled in Parliament. All government schemes shall be subjected to social audit. -Amendment in Aadhaar Act to restrict its uses, omitting provisions that may have 'diluted' the Right to Information Act. -Establishing a Court of Appeal between the Supreme Court and the high courts and making the SC a purely constitutional court. -33 per cent reservation for women in Parliament and state assemblies. -Bill to prohibit practices of triple talaq and nikah halala. -Affordable maternal healthcare for all women through various schemes. -33 per cent reservation for women in Lok Sabha, state assemblies and in central government jobs. -Review of Sexual Harassment of Women at Workplaces Act, 2013 and extension of it to all workplaces. -Night shelters for women migrant workers, adequate number of public toilets for women, ensuring working women’s hostels and safe transport facilities. - Zero tolerance against terrorism by giving a free hand to security forces. - Abrogation of Article 379 and annulment of Article 35A of the Constitution of India. Ensuring safe return of Kashmiri Pandits and resettlement of refugees from West Pakistan and Pak-occupied Kashmir. - Completion of National Register of Citizens and its extension to other parts of the country. - Enactment of the Citizenship Amendment Bill while protecting the linguistic, cultural and social identity of the people of Northeast. - Promise to adopt 'uncompromising approach and hard measures' against terrorism and infiltration. - Initiating dialogue with people of Jammu and Kashmir without 'pre-conditions'. - Review the deployment of forces. Moving security forces to the border and reducing their presence in the Valley. Review of Armed Forces (Special Powers) Act. - Restoring special status to NE states, revoking Citizenship Amendment Bill and ensuring no exclusion of citizens from NRC. - Implementation of 10 per cent reservation for economically weaker sections. - Schools in every block having more than 50 per cent SC population and at least 20,000 tribal people. Protecting rights of forest dwellers. - A law against mob lynching and hate crimes. - Restoring 200-point roster system and providing reservation in promotion through Constitutional Amendment. - Ayushman Bharat to provide health cover of Rs 5 lakh to 10.74 crore poor families. 1,50,000 Health and Wellness Centres to be set up by 2022. - Doubling healthcare expenditure to 3 per cent of gross domestic product. Right to Healthcare Act ensuring free diagnosis, out-patient care, medicines and hospitalisation. - Making India the third largest economy of the world by 2030. Committing to make India a US $5 trillion economy by 2025 and US $10 trillion economy by 2032. - Lowering of tax rate thereby rewarding honest tax payers and improving compliance. - To continue with the simplication of GST process by engaging in dialogue with all stakeholders. - A more robust and transparent economy with fiscal compliance and keeping independence of institutions intact. - Amalgamation of public sector banks and simplification of KYC process. - Replacing GST with GST 2.0, ensuring single, moderate, standard rate of tax. Ram Temple: A promise to explore all possibilities within the framework of the Constitution and all necessary efforts to facilitate the expeditious construction of the Ram Temple in Ayodhya. NYAY: The Nyuntam Aay Yojana, or minimum income support programme will indentify 20 per cent poorest families of the country and they will be guaranteed Rs 72,000 a year. Sai's Take: Ah, that's what Cong manifesto says!